The Revd Dr Steven Underdown is Resident Chaplain and Co-ordinator of Ministry at Burrswood Health and Wellbeing, Kent, UK. His background is in philosophy and science. For twenty years, before moving to work in a parish and in hospital and hospice ministry, he was a member of an Anglican contemplative monastic community. From an interview with the publishers, August 2018. I am an Anglican priest, now working as Resident Chaplain and Ministry Co-ordinator at Burrswood, a small Christian health-care and retreat centre in Kent (UK) some 40 miles South-East of London. Before I moved to Burrswood I was working as a chaplain at a large hospital in Brighton (Sussex, UK) and I was also parish priest of St Patrick’s Hove, a unique parish, with both a rich liturgical life and a major ministry among the homeless. Prior to that, for a little over 20 years, I was a member of an Anglican contemplative community. Both the parish and the monastic community—itself most remarkable—feature in the book. How did your book come to be written? It began as a PhD thesis, undertaken at King’s College London. My supervisor was Andrew G Walker. Professor Walker has an academic background, not only in theology, but also in sociology. One of his principal interests is the relationship of the age-long, main-stream tradition of the Church to contemporary culture. After I submitted the thesis, Andrew and others encouraged me to look to publish it as a book. But life took many twists and turns, and it took a long time to get that done. You say you are Anglican. That is a very diverse community of churches. Where on the theological spectrum do you stand? The Anglican monastic community of which I was a part was greatly influenced by its contact over many years with priests, monks, nuns and others from the Orthodox Churches. While the community saw itself as standing within Western Christian tradition, nonetheless, it recognized there was much to be gained from contact with the Orthodox. One result was that the Community’s liturgy came to draw heavily on Eastern liturgical tradition. The influence of Eastern Orthodoxy is very evident in my book. One Orthodox theologian described me as “thinking like an Orthodox.” Something I take as a compliment. I was much heartened when, after reading an early draft of the thesis, Metropolitan John Zizioulas, then a Visiting Professor at King’s, said he considered the work ‘very interesting and very important’. The book is said to be a work in ‘applied theology’. What exactly does that mean? The book looks to be grounded in what my monastic community called the One Great Tradition of the Church. I see this tradition as witnessing to the heart of the gospel and as encompassing the core beliefs and practices proper to the Church: worship and prayer, repentance and the transformation of life, commitment to the study of the Scriptures and of the theological and spiritual traditions of the Church, and commitment also both to mission and to pastoral ministry—ministry most especially among the marginalized and deprived. This tradition is understood to be grounded in the fundamental doctrines of the church: the Trinity, the Incarnation, the on-going work of the Spirit in the Church—all linked to the Paschal Mystery—, and as having been witnessed to, down the ages, by the saints and holy ones of the Church, both East and West. I suppose this tradition corresponds, more or less, to the ‘Mere Christianity’ of C.S. Lewis or to what he and others have sometimes have called the ‘Deep Church’. I try to explore some of the practical, pastoral implications and applications of that tradition. How can the life offered in Christ be realized? How can we grow into the Paschal Mystery? the life of the Christian community be so ordered as to facilitate response to the divine initiative? The title of the thesis mentioned ‘personhood’. Can you say a little about how you approach this? Personhood is a key theme of my work. Indeed, I argue that there is no ontological category more fundamental than personhood, and that that being so, there is nothing more important about any of us that we are created as a person. 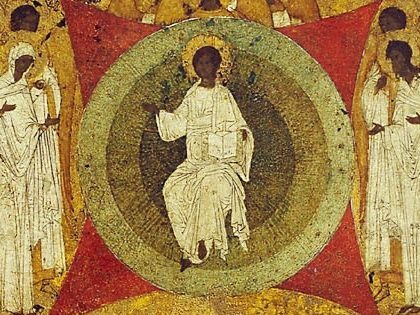 And yet I also argue that, though each of us is created as a person, we are also created with a call to attain to fullness of personhood—in image of the fullness of personhood belonging to the three Divine Persons—and more specifically, as manifest in the incarnate Son. We have a work to accomplish. So it is that I am also concerned with how the Christian community can so order its patterns of life and worship as to facilitate such growth. The title of the thesis also mentions a theology of time. What do you offer here? It will come as no surprise that I see time as a context for growth. What I offer that is novel, though, is the suggestion that time can function what I term iconographically. The belief is that God is active in time and specifically, that God uses time to reveal aspects of the life and relationships to which we are called. A focus of my work is the Jewish understanding (and use) of the Sabbath. I look to explore the value of the Sabbath for Christian life, but in doing so, I carefully distinguish the Sabbath from Sunday. The day of beginnings, Sunday, complements and yet contrasts with the Sabbath (Saturday), the day of rest and fulfilment. Finally, where does the title of the book come from? From its earliest days, the Church believed that the resurrection of Jesus both completed the first creation and also inaugurated a radically new era, a new age for humanity and for all creation. Unanimously, the Gospels place the Resurrection on a Sunday. They place it, in other words, on the day after the Sabbath; that is, on the first day of a new week. But that day wasn’t simply the first day of (simply) another week, a week like any other. It was also the first day of a new aeon, the first day of a whole new epoch. So it was, then, that the both the day of the resurrection and the new aeon it introduced came to be called the Eighth Day. In a word, then, the call to the members of the Church, and indeed to all humanity, is to live nowhere other than in, already, today — the Eighth Day.